In what’s either a boon to or the bane of high school teachers everywhere, website Personal Creations has compiled a visual infographic of popular books and the approximate time it would take to read each one based on the average person’s reading pace. Classics like The Great Gatbsy, it shows, should only take a little over two-and-a-half hours to read, hardly more than Baz Luhrmann’s 142-minute 2013 film adaptation, so no excuses, kids. George R.R. 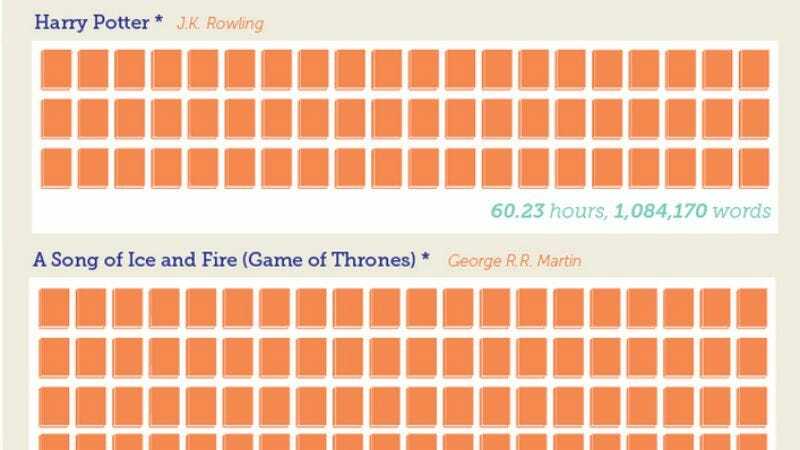 Martin’s ongoing A Song of Ice And Fire series, on the other hand, clocks in at a whopping 98.33 hours of reading (so far)–significantly more than the televised adaptation–though sadly the chart does not break down how many of those reading hours are devoted to loving descriptions of feasts. The creators are also quick to note that their formulations do not take reading difficulty into account, which explains the inclusion of Ayn Rand’s Atlas Shrugged on the list, a book notable for being impossible to get through in any amount of time.